Posted on March 1, 2018 at 2:35 am. 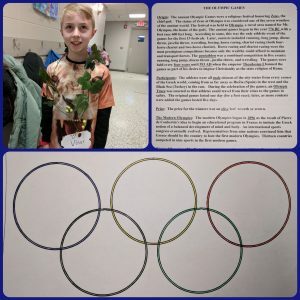 February was a fantastic month in our Elementary Enrichment Classes as it coincided with The Winter Olympics. This month also continued with the theme of traveling back in time to explore ancient techniques of music and art. Students investigated ancient artifacts to get a first hand feel for what it was like in ancient times, and used that information to recreate those time in the classroom. Let’s take a look inside the enrichment classrooms for this month. 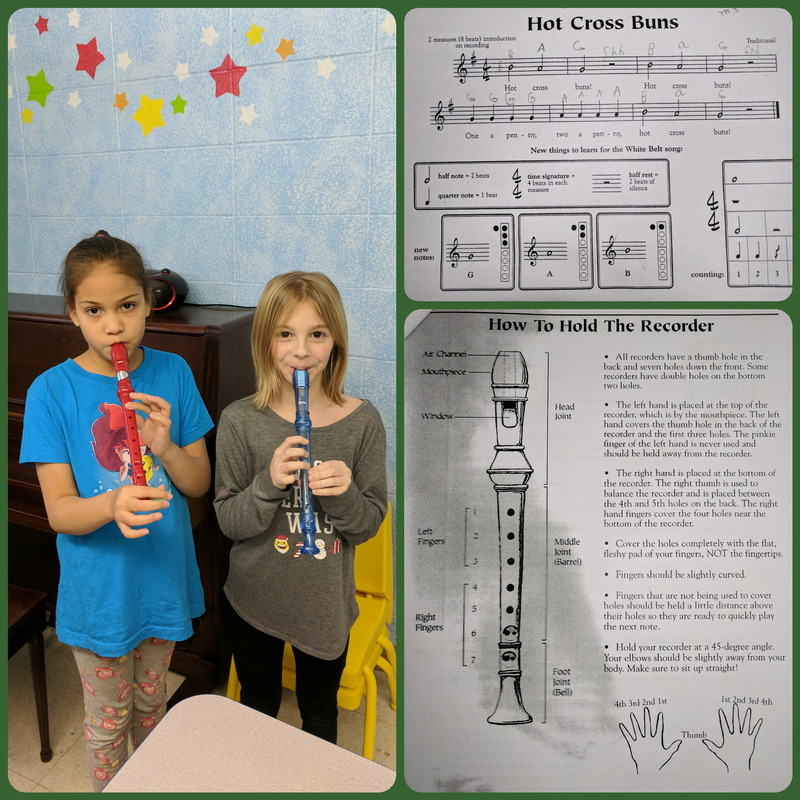 In Music, students have begun playing and practicing the recorder. This is simply a joy to every student who has played one before, and to every student just being introduced to it. Starting from the ground up, students learned the in-depth history of the recorder, how to hold the recorder, the proper finger placements, then finally, drawing on their sheet music reading skills developed earlier in the year, reading music and playing well-known songs. In contrast to the hand-bells, each student is responsible for their own timing and musical scale. This full musical responsibility flexes their figurative rhythm muscles and their literal minor muscle group dexterity. Each student is given a “belt” and accompanying sheet music that is challenging but within their zone of proximal development. The students practice their pieces and can “test out” by preforming their piece for the class, and are then promoted to the next belt level and a different piece of music to master. This course of exposure, practice, and performance allows the students to absorb the essences of reading, playing, and making music for others, which in turn solidifies confidence not only in music, but in body awareness, spacial ability, and the connection between theory and reality. 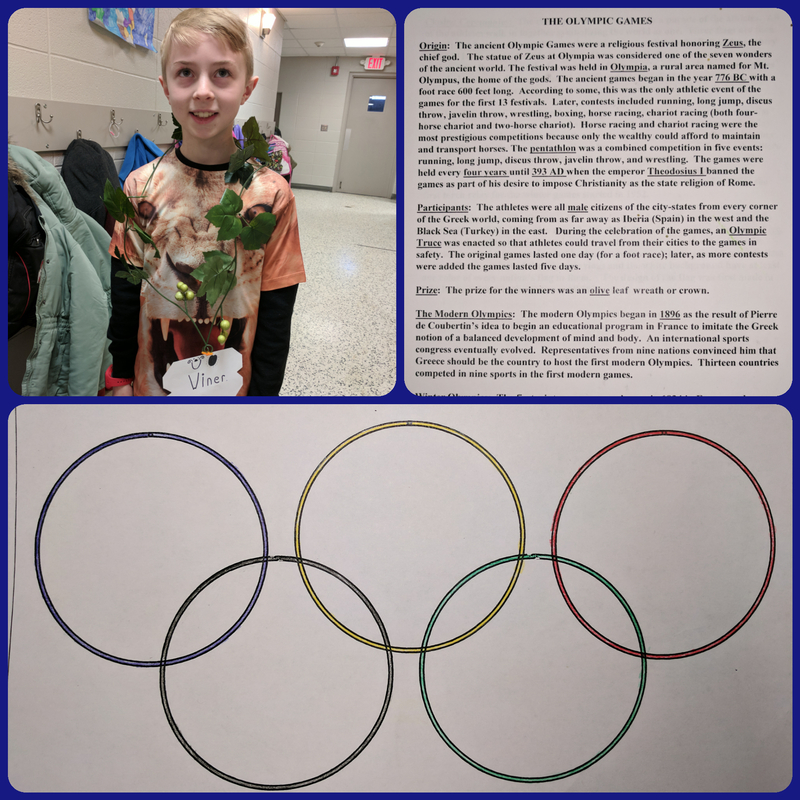 In Latin, students celebrated the The Winter Olympics by studying the origins and history of The Olympics, and participating in their own Mini-Olympics, complete with grape vine medals for the winners. In lieu of wrestling and chariot racing, students participated in a balloon race, ring toss, and Latin trivia. Alongside this, students recreated The Olympic rings and solved Olympic puzzles. In studying the basis of this ancient event, students can further see the importance and magnitude history has on the culture we have today. In Art, students completed their self portraits in ancient Egyptian style and wrote their names in hieroglyphics. These works were showcased on the staircase of the Tallmadge campus. 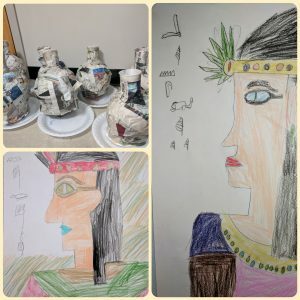 Staying in their time machines, students also created 2-dimensional vases in ancient Egyptian style, using symbols, patterns and figures to depict different ideas and emotions. Through this project, students began to realize how difficult it was for ancient people to express complex ideas, even when they had advanced much further away from cave paintings. The highlight of this month has surely been the creation of 3-dimentional papier-mâché Egyptian vases. These vases have been built around a balloon, with a ring installed for a base, and bottomless paper cup for the neck. 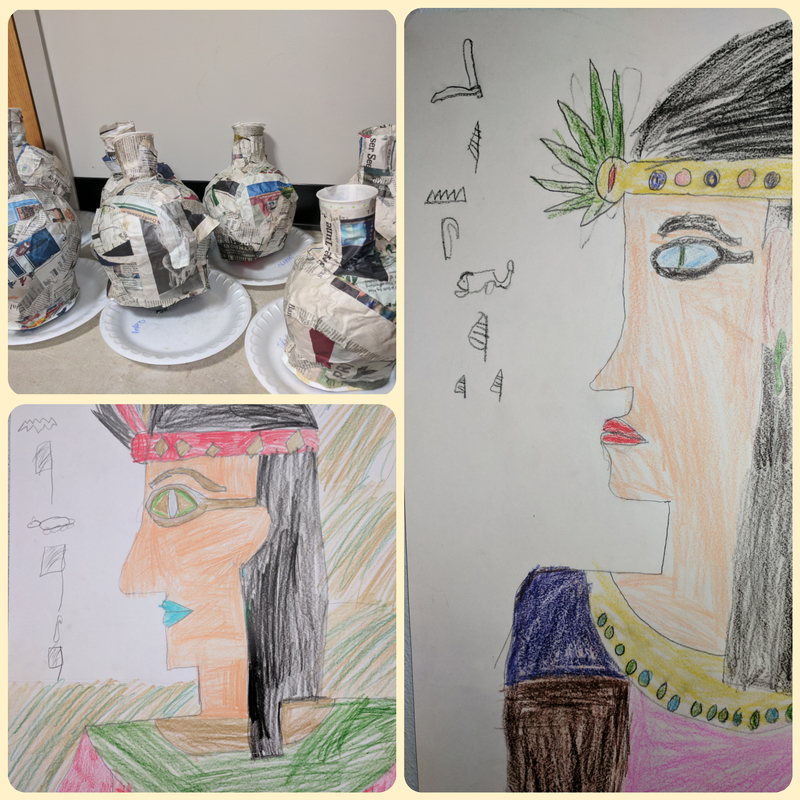 While constructing this work in progress, it has become obvious to the students how truly talented ancient artists were- their vases were made of hand-made clay, formed by hand, and sun dried, after being painted with handmade paints and pigments. By making these vases, the students are instilled with a sense of appreciation for the ancient artists not only for their craft, but also for their dedication to such a tedious art form. With all the energy built into February, time seemed to zip by as we studied the intersections of ancient time and current time. With these studies, students are even more connected to history’s influence on the present, and have learned the ever-present affect it has on our everyday lives. We can’t wait to explore what is in store for the next month’s journey in Art, Latin, and Music.